Eight professionals are seated around a conference table on the 36th floor of a sleek Manhattan office tower on a recent weekday evening. For two hours, they talk about work. Their conversation weaves between topics like venture capital funding, start-up marketing and management styles. "You have to just do it, even if you don't want to," one woman says, referring to networking. Heads nod in agreement. "All the best jobs, I hate to say it, they're just not posted." Everyone seated at the table is a woman. They meet monthly to talk about their professional struggles and triumphs. But they are not co-workers or long-time friends. This is a Lean In Circle, one of thousands born out of Sheryl Sandberg's best-selling 2013 book Lean In: Women, Work, and the Will to Lead. The book, co-written with Nell Scovell, calls on professional women to "lean in" by striving for leadership positions in their jobs and examines what factors often deter women from doing so. On Thursday, Leanin.org, Sandberg's non-profit organisation, launched its latest public awareness campaign, Lean In Together, or #LeanInTogether as it's being known, in partnership with basketball organisations the NBA and WNBA. The campaign is focused on men's roles in reaching gender equality. "Why men? They're 50% of the population and if we're going to get to true equality we need them to participate," says Rachel Thomas, the president of Leanin.org. Lean In was published two years ago this month. 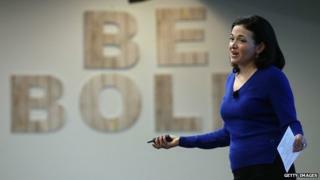 Sandberg, Facebook's chief operating officer, describes it as "sort of a feminist manifesto". The original book has sold over 2.25 million copies worldwide. A newer edition, Lean In For Graduates, came out last April. "The catchphrase of 'lean in' - that has gone global," says Astrid Henry, a professor of gender studies at Grinnell College, Iowa. She describes Sandberg as an enormously successful modern spokesperson for feminism: "Her influence and her visibility at this moment can't be overestimated." One measure of Lean In's influence is its network of Lean In Circles. These small, in-person and online peer group meetings have cropped up within companies, on college campuses, and in towns and cities around the world. "When we launched, we would have been happy with a thousand Lean In Circles," says Rachel Thomas. Today, there are over 21,000 Circles in 97 countries registered with Leanin.Org, including circles in all five branches of the US military. Image caption Beyonce: "I'm not bossy - I'm the boss"
As part of Ban Bossy, its last major public awareness campaign, Leanin.org released a video with appearances from celebrities including Jennifer Garner and Beyonce. It has been viewed more than 2.5 million times on YouTube so far. Lean In's initial critical reception did not predict the growing worldwide engagement of hundreds of thousands of women within the next two years. Many reviewers deemed the book too narrowly focused on women like Sandberg: educated, white, wealthy and with opportunities beyond the reach of most women. Others questioned the messenger: could Sandberg, who has two Harvard degrees and an estimated net worth of $1bn (£655m), offer relevant guidance to the average woman? Another oft-repeated criticism is that Sandberg's approach remains too focused on individual behaviour, rather than societal or structural shortcomings. Brenda Christensen, who runs her own public relations company in California, says she views Lean In as hypocritical in light of the fact that Facebook, Sandberg's employer, has a largely male workforce. "She's been putting the onus on women," says Christensen. "The onus needs to be on corporations." Or, others contend, on government. "[Sandberg] sends out a message that's very important about self assertion and confidence, but the majority of women in the United States are making $15 an hour or less," says Prof Henry. "They're not in jobs where they're going to have opportunities to lean in." She marked every page where Lean In discusses policy solutions and says she was disappointed to find there were "so few of them". Leanin.org's Rachel Thomas acknowledges that policy changes are "incredibly important" but goes on to say: "We additionally believe that driving individual change is really what we need to do, as a culture, to move the dial." Criticisms notwithstanding, many of the women who have read and embraced Lean In say it has had a galvanising effect on their lives. Lauren Kay, 25, read Lean In from cover to cover on 23 March 2013. The next day she had the idea for her matchmaking start-up and bought the domain name DatingRing.com. "[Before reading Lean In] I had always wanted to start a company in the dating space but I didn't really think I was qualified," says Kay. But Sandberg's explanation of imposter syndrome, or "capable people being plagued by self-doubt", changed her mind. Eileen Carey, 29, also credits Lean In directly with inspiring her to found her company, Glassbreakers, a peer-mentoring platform for women. Reading the book, Carey says, "felt like this kind of wake-up call". Debby Carreau, who runs her own human resources company, calls Lean In her "passion project". She says she's helped launch over 100 Circles and spoken at various Lean In events to thousands of women. Furthermore, she has seen several male chief executives give Lean In out to their employees. "I know of at least six," she says. Lean In has also had a more personal impact on many women. This has been the case for Mindy Engberg, 52, a captain with United Airlines. For most of her career, Engberg downplayed her success as one of a relatively small number of female commercial pilots. "It's not a big deal, anybody can do it," she used to say of her job. Since reading Lean In, however, Engberg says she has made concerted efforts at "not apologising that I do fly a plane". Sandberg herself consistently hears about one outcome that Lean In has had in offices around the world. "Everywhere Sheryl travels, CEOs take her aside and make the joke that Lean In is costing them money," says Rachel Thomas. That's because more and more women, these executives tell Sandberg, are asking for pay rises - and, in many cases, are getting them. What would Sheryl Sandberg do?